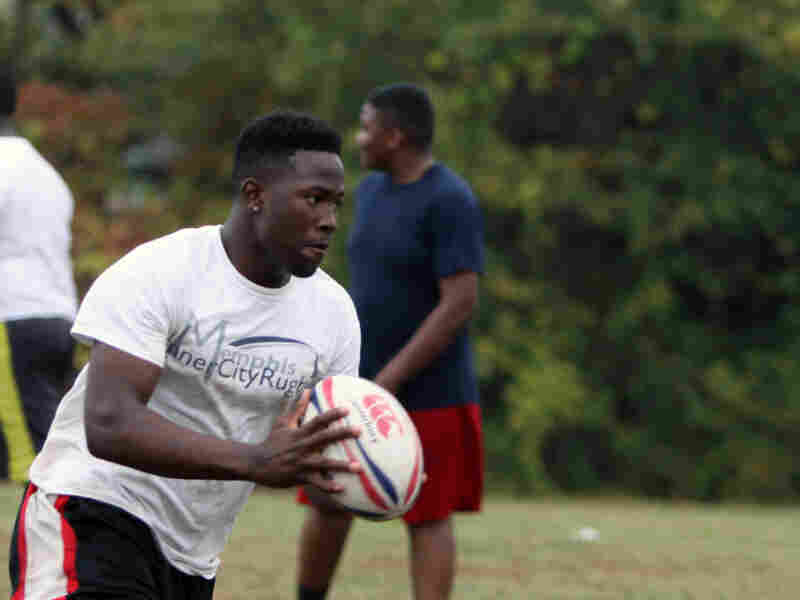 An Inner-City Team Is Putting U.S. Rugby On The Map While it's a popular sport overseas, rugby has struggled to get a strong foothold in the U.S. One program in Memphis, Tenn., is now having a lot of success, earning even international attention. Without a school athletic field, the Power Center Academy rugby team practices in a city park nearby, changing clothes in the dugout next to a baseball backstop. If you're a sports fan in this country, it's more likely you'll be tuned into the World Series than the Rugby World Cup this weekend. And here, rugby is more associated with prep schools or elite colleges. But now that one Memphis high school rugby team has flown onto the international radar, that could change. Coach Rob Reetz recently took over one of Tennessee's fastest rugby teams. But fast doesn't go well with mud and rain, and he blames the weather for last season's championship loss. "Every year when we get to a championship game in any kind of tournament, somehow it's always raining," Reetz says. "That seems to be our Achilles' heel. So getting a practice in the rain is awesome." "Basically it was football and soccer put together. No pads!" says 17-year-old senior Calvin Gentry. Power Center Academy senior Calvin Gentry, 17, has been offered rugby scholarships to several colleges. Like most muscular, tough kids, he wanted to play football, but his school couldn't afford a team. Power Center Academy is a public charter school in impoverished south Memphis, located in a strip mall. Its athletic teams practice in local parks and use gyms at other schools. Then in 2012, Principal Steevon Hunter held what he promoted as a "football interest meeting." "The guys showed up in droves, and that's when Shane [Young] introduced rugby as a sport to them, and they were captivated ever since," Hunter says. Shane Young had come to Memphis with Teach for America, but he really wanted to start a rugby team. He quickly addressed the sport's bad reputation. "If you go YouTube rugby, you get a really biased look at what the sport is because they show you all the roughest, most violent tackles," Young says. Players meet these tackles without helmets or pads, while running what looks like an over-inflated football across a goal line. He couldn't understand why it wasn't more popular at inner-city schools. "Rugby is the lowest-cost sport you could possibly play," he says. "You don't need anything but a patch of grass and a ball." And with little more than a ball, Young's first team went from losing every game that first season, to last year, when they won almost every game. Three players became national All-Stars. Success didn't surprise Young, but his all-African-American team did stick out in Tennessee, where the sport is mostly played in wealthy, white suburbs. "We reminded our kids they're in a fishbowl, and they are being watched, and they are being judged, sometimes unfairly," Young says. At Power Center Academy, junior Samuel Johnson walks the halls with his rugby ball cradled like a baby in his arms. He was hooked from game one. "The second game, I couldn't play because my grades were terrible," he says. Now Johnson is college bound, one of several players being recruited. About 30 American colleges offer rugby scholarships. That's one reason, says senior Calvin Gentry, that his team plays harder than their private school rivals. "We play rugby because we need to go to college, and they play it because it's just a sport to them, and like, we live rugby, and we want to go to college for this and we want to get scholarships," he says. By next spring, Memphis will have six inner-city rugby teams, with around 170 players. And their growth is being watched overseas; Shane Young has talked to the BBC and the Guardian newspaper. He says communities like south Memphis have a lot of untapped athletic potential for their sport. And if rugby takes off here, Young says, "they say, 'Wow, this is a sleeping giant.' Give it one more generation of players to come through, pretty soon USA Rugby will be competing in the World Cup and hopefully not just going and losing every game." While it's still a long way from a muddy city park in Memphis to the World Cup of rugby, these kids have come so far already.